Playing on youths’ tech savvy, new initiatives designed to promote healthy eating and exercise to prevent obesity are reaching children via online games, text messaging, and more—and yielding some encouraging results. In March, the USDA and First Lady Michelle Obama launched Apps for Healthy Kids, a competition to challenge software developers, game designers, students, and other innovators to develop fun software to promote healthier eating and physical activity among children aged 9 to 12. This is the latest obesity-prevention initiative using new, interactive technologies to encourage healthy lifestyles among children. Nationwide, 19.6% of children and 18.1% of adolescents are obese.1 An estimated 80% of adolescents who are overweight become obese in adulthood.2 Medical complications common in children who are overweight include hypertension, type 2 diabetes, respiratory ailments, orthopedic problems, trouble sleeping, and depression. Obesity-prevention experts have long blamed the alarming rise in childhood obesity on the increased use of television, video games, and other sedentary activities. However, given its ubiquitous use, researchers and health professionals are increasingly looking to such technology as channels of health communication to youths. A growing body of research is demonstrating the effectiveness of multimedia and interactive online interventions in increasing knowledge and intention to change health behaviors. This article will explore some new forms of technology that are teaching kids about healthful eating and physical activity. Close to one third of U.S. teens connected to the web have used it to find health and fitness information.4 Numerous websites have sprung up in an effort to provide accurate nutrition information to younger audiences. NourishInteractive.com offers online nutrition games to educate children about the food pyramid, meal planning, concepts of energy balance, and the importance of physical activity. Key features of their games include interactive learning, difficulty levels tailored to different age groups, and audio instructions for children who have not yet learned to read. 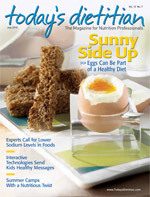 The parents’ area features grocery and cooking tips, recipes, and nutrition articles. The advisory board of NourishInteractive.com includes RDs and nurses with expertise in weight management, diabetes, and children’s health. Federal health agencies have also jumped on the online multimedia bandwagon. MyPyramid.gov offers a flash game to teach youths about the 2005 Food Guidance System. BestBonesForever.gov, developed by the Office on Women’s Health of the U.S. Department of Health and Human Services, targets girls aged 9 to 14 with interactive quizzes, jokes, and recipe ideas to promote physical activity and consumption of calcium-rich foods. The website links to an interactive flash animation game—Powerful Girls by B*tween Productions, Inc—in which characters choose calcium-rich foods and engage in physical activity in order for the player to unlock new outfits in a virtual boutique. Rigorously reviewed by pediatricians and other medical experts, KidsHealth.org provides information for parents, kids, and teens on topics ranging from positive parenting, growth and development, sexual health, nutrition, and fitness. Article topics for teens range from vegetarianism, body image, fad diets, and goal setting to safety tips in addition to more common nutrition topics such as food label reading and healthy snacking. The site for kids offers games and movies on various health issues. Given that today’s kids are more likely to search online for information rather than in the library, the web is an important medium for dietitians and other health professionals to educate kids about nutrition and fitness. A growing phenomenon across the United States and overseas, “exergaming” refers to video and computer games that promote physical activity. A well-known example is Konami’s Dance Dance Revolution, a video game that requires players to perform steps on a dance pad. Dance Dance Revolution has been one of the most researched exergames and has been demonstrated to increase children’s heart rate within a range for developing and maintaining cardiorespiratory fitness. The Wii Fit is the latest example of exergaming and an extremely popular one. According to Nintendo statistics, more than 22 million copies of the Wii Fit have been sold worldwide as of December 2009. The Wii Fit and other exergaming systems are being incorporated into traditional venues of physical activity, including community and recreation centers, schools, and workplace fitness programs. Emily Owens, CHES, an elementary physical education teacher in New York City, says many of her students who play sports on their Wii Fit at home become excited when they play the actual games in physical education class. Smartphones and portable media players such as the iPhone and the iPod touch offer applications with educational value, particularly in the area of health and nutrition. The iPod touch, a portable media player and personal digital assistant, offers applications that teach students about the nutritional value of meals at popular chain restaurants. HealthCalc helps users find their ideal weight and the calories they need to maintain that weight. iFitness offers a comprehensive exercise database, providing images of people performing various exercises. Additionally, researchers at San Francisco State University are starting to use smartphone technology to collect observations of daily living, including physical activity and food intake, of low-income teens managing obesity and depression. The collected information is shared with the teen’s healthcare team more easily than more traditional self-monitoring methods, so this helps teens and their healthcare team better set health goals and track progress with the ultimate goal of improving the teens’ physical and mental health. Entertainment education has been used in the United States and abroad to address various health and social issues. It is growing in popularity in the field of nutrition education, particularly as entertainment—through television, movies, music, and the Internet—occupies a growing proportion of adolescents’ recreational time. Jump With Jill is a multimedia health program created by Jill Jayne, MS, RD, that fuses health education and music in interactive programming for children and families. Jayne’s programs include a touring live show, audio CD, and blog. The live show is a rock-and-roll concert for elementary school students that teaches them nutrition topics, including food label reading, physical activity, hydration, media literacy, and body image. Jayne’s Get Me Goin’ CD blends a variety of musical genres in a soundtrack that promotes healthful lifestyles. Created by Barbara Storper, MS, RD, FoodPlay Productions is an Emmy Award-winning nutrition media company that offers live theater shows in schools. The shows feature music, juggling, and dancing to teach children about healthy choices. The Magic of Nutrition is a nutrition magic show created by Todd Kupper, RD, LDN, that combines nutrition messages with illusion, comedy, live animals, and audience participation. Entertainment education offers an opportunity to promote positive attitudes toward healthful lifestyles in an engaging and age-appropriate fashion. While technology offers an opportunity for reaching youths in general, messages can be further tailored to kids at high risk for obesity, namely low-income, minority youths. Motivational Educational Entertainment (MEEProductions.com) is a social marketing and communications firm that develops health communication campaigns for urban, ethnic, and underserved audiences. Its obesity-prevention projects include the development of GetFitGetRight.org, a website that offers youths tips for healthful eating and physical activity. The website features a reality show that follows six overweight teens in Los Angeles in their efforts to improve their eating and exercise habits. By engaging youths at risk of becoming obese in the production of media promoting healthful lifestyles, interactive technology offers an opportunity to empower youths to take charge of their own health. Health communication via smartphones or websites is no different from other health communication strategies. Nutritionists and health professionals should be mindful and deliberate about which messages they are trying to get across to youths. While prevention messages may help deter them from less healthful behaviors, they often do not offer feasible alternatives. According to a report by Motivational Educational Entertainment on communicating with urban black youths, teens expressed the sentiment that “while everyone is telling them what not to do, few are telling them what to do.” While documentary films such as Super Size Me raise awareness about the health effects of a diet of poor nutritional quality, they offer few actionable solutions. Youths, especially older youths, need positive messages and practical strategies for adopting and maintaining healthful lifestyle practices. Given the stigma that youths who are overweight experience, interventions aiming to prevent obesity should be framed as promoting healthful eating and physical activity. While interactive technology offers an opportunity for reaching youths with obesity-prevention messages, it does not come without its potential negative side effects. A 2007 report by Ahern and colleagues expresses the concern in “leveraging electronic media (eg, incentivising children and teens with video game, or especially, TV time) to combat childhood obesity when it may potentially exacerbate the problem of overweight and obesity amongst youth.”7 Given that children see an estimated 40,000 ads per year on TV alone and that media advertising targeting youths often promote unhealthy foods2, caution must be taken when promoting interactive media and technology as outlets for nutrition education. Technological applications could potentially reach kids in a more cost-effective and efficient manner than conventional approaches, particularly given their ubiquitous presence in today’s society. However, adopting technological approaches for promoting good nutrition and physical activity must take place within the context of a larger, multifaceted approach to tackling childhood obesity. The educational value of smartphone applications that list the nutritional content of fast food does not substitute for the increased availability of fresh fruits and vegetables in low-income neighborhoods. Dietitians should take advantage of the opportunities that interactive technology provides for the promotion of healthy lifestyles among youths while continuing to advocate for and work to address the systemic causes of childhood obesity. — Melissa Ip, MA, RD, is a health educator in New York City. 1. Ogden CL, Carroll MD, Curtin LR, Lamb MM, Flegal KM. Prevalence of high body mass index in US children and adolescents, 2007–2008. JAMA. 2010;303(3):242-249. 2. Kaiser Family Foundation. The role of media in childhood obesity. 2004. Available at: http://www.kff.org/entmedia/upload/The-Role-Of-Media-in-Childhood-Obesity.pdf. Accessed April 27, 2010. 3. Prensky M. Digital natives, digital immigrants. On the Horizon. 2001;9(5):1-2. 5. Lieberman DA. Dance games and other exergames: What the research says. University of California, Santa Barbara. 2006. Available at: http://www.comm.ucsb.edu/faculty/lieberman/exergames.htm. Accessed April 27, 2010. 6. Shapiro J, Bauer S, Hamer R, et al. Use of text messaging for monitoring sugar-sweetened beverages, physical activity, and screen time in children: A pilot study. J Nutr Ed Behav. 2008;40(6):385-391. 7. Ahern DK, Phalen JM, Le LX, Goldman RE. Childhood obesity prevention and reduction: Role of eHealth. Health e-Technologies Initiative. 2007. Available at: http://www.hetinitiative.org/Childhood%20Obesity%20Prevention%20and%20Reduction%20-%20Role%20of%20eHealth.pdf. Accessed April 27, 2010.